MINNETONKA, MINN., July 11, 2017 – Wallace Carlson Printing is pleased to announce that it is being awarded the “Benny,” the highest honor in the Printing Industries of America’s 2017 Premier Print Awards, for its promotional piece entitled “It’s all in the Setup … and the Finish.” This year, more than 2,200 entries were submitted by printing, packaging and graphic arts firms in eight countries, and judges awarded the prestigious Benny to the top entry in each category. Hosted by the Printing Industries of America (PIA), the Premier Print Awards are the printing industry’s oldest and largest worldwide graphic arts competition. Now in its 68th year, the annual contest promotes excellence in print communications and rewards companies and individuals for their creation and production of the very best in print media. Each year, only the most worthy of pieces receive Awards of Recognition, Certificates of Merit and the highest honor – the Benny statue, which has become a universally recognized symbol for excellence in the printing industry. “This award is a testament to our commitment to quality craftsmanship and relentless ingenuity in printing and packaging. It’s an honor to be recognized by the industry as a company that produces award-winning pieces,” said Charlie Cox, COO of Wallace Carlson Printing. Cox will be in attendance at PIA’s Premier Print Awards Gala at the Marriott Downtown Magnificent Mile in Chicago on Sept. 10, 2017, to accept the Benny award. Wallace Carlson’s entry in the Print/Graphic Arts Self-Promotion category, a promotional piece entitled “It’s all in the Setup … and the Finish,” garnered the attention of the judges for its unique design and creative print techniques. It was produced on an eight-color Komori Lithrone G840LP-H-UV sheetfed offset perfecting press. A variety of innovative binding and finishing techniques were incorporated into the design, including several French fold pages, double-thick and glued covers, stitch/sewn covers on the face, die cuts, embossing, and Wire-O binding. Printing Industries of America is the world’s largest graphic arts trade association representing an industry with approximately one million employees. It serves the interests of over 7,000 member companies. Printing Industries of America, along with its affiliates, delivers products and services that enhance the growth, efficiency and profitability of its members and the industry through advocacy, education, research and technical information. Learn more at www.printing.org. 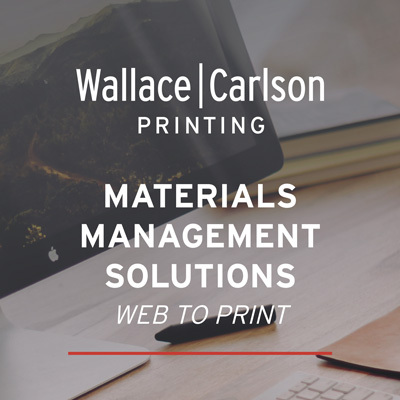 Wallace Carlson Printing is a national commercial printer headquartered in Minnetonka, Minn. Founded in 1931, Wallace Carlson continues to invest in new technologies that position it for continued growth in a competitive print market. Over 50 dedicated employees work together to produce top-quality marketing materials, catalogs, direct mail and packaging using sheet-fed litho and digital print equipment for a wide variety of clients. Learn more at wallacecarlson.com.